Google I/0, the search giant's enormously popular developer conference, sold out this morning in about 20 minutes - only a third the time of last year's rush -- sparking a round of grumbling from those who didn't get tickets ... and the predicable appearance of scalpers on eBay. Vic Gundotra, Google's senior vice president of engineering, broke the news a half-hour ago through a post on Google+: "Google I/O has officially sold out! It took just a bit over 20 minutes! (We were experiencing 6,250 qps load on our servers at 7:01am!). While we're overwhelmed with the interest and enthusiasm around Google I/O, we know it can be very disappointing and frustrating when an event sells out this quickly." Disappointed doesn't begin to describe the reactions of those left out of the June 27-29 event in San Francisco. Writes one such person on Google+: "I don't want to sound like a crack pot conspiracy person, but were the tickets truly first come first serve? I tried 3 times at 7AM, 7:04, and 7:08 with no luck. My buddy tries at 7:10 for the first time and gets one. How is a company that brags about being instant not able to develop a proper queuing system?" Adds another: "What really upsets me is that it clearly said on the page that it would be first-come, first-served, which was clearly not the case. How hard would it have been to just not write that on the page if it wasn't true?" 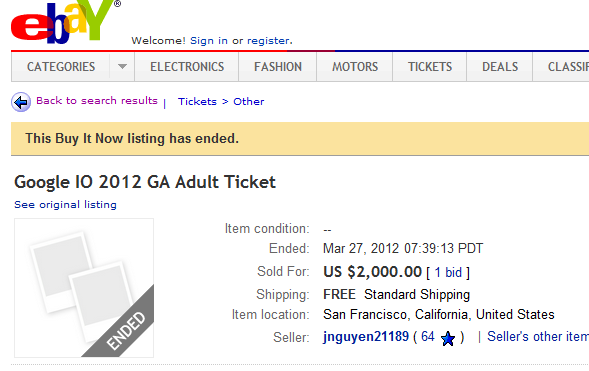 It was said that tickets had appeared on eBay already selling for as much as $4,500. This photo shows what appears to be a sale for $2,000. So, if you weren't able to land a ticket today, see you at I/O Live (goo.gl/K8KQ4) or one of our Extended (goo.gl/ypL0q) locations in person! No one seemed satisfied with that peace offering. Holdouts explain why they aren’t buying an iPad. If the “ridiculous” Dow had chosen Apple instead of Cisco. No, Wikipedia has not forgiven GoDaddy for backing SOPA. Another survey that shows vendors think you’re stupid. Dying Jobs kept letter from Gates at his bedside.